For a long, long time, tracking the progress of my readers felt like a ride on a huge swinging pendulum. I was always looking for a method that would work for me, yet I always settled on something either too complicated and fussy, or too open-ended and random, or just plain meaningless, all of which created this Bermuda Triangle of short-lived attempts at tracking my students as readers. Where I write from today is where I landed after finally sliding my way off the pendulum, somewhere (I hope) near the middle of its swinging arc. 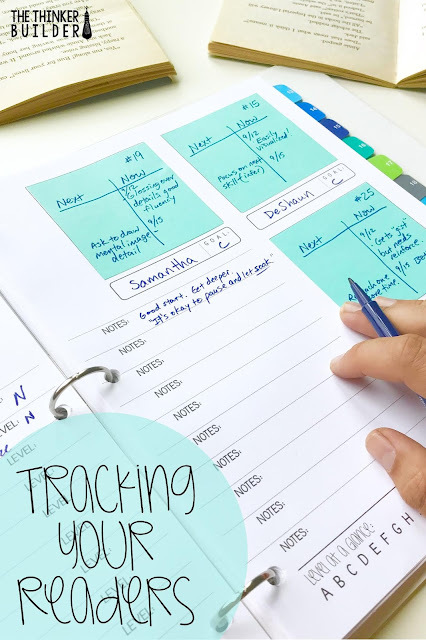 I want to show you how I track readers, and of course the thinking behind it. 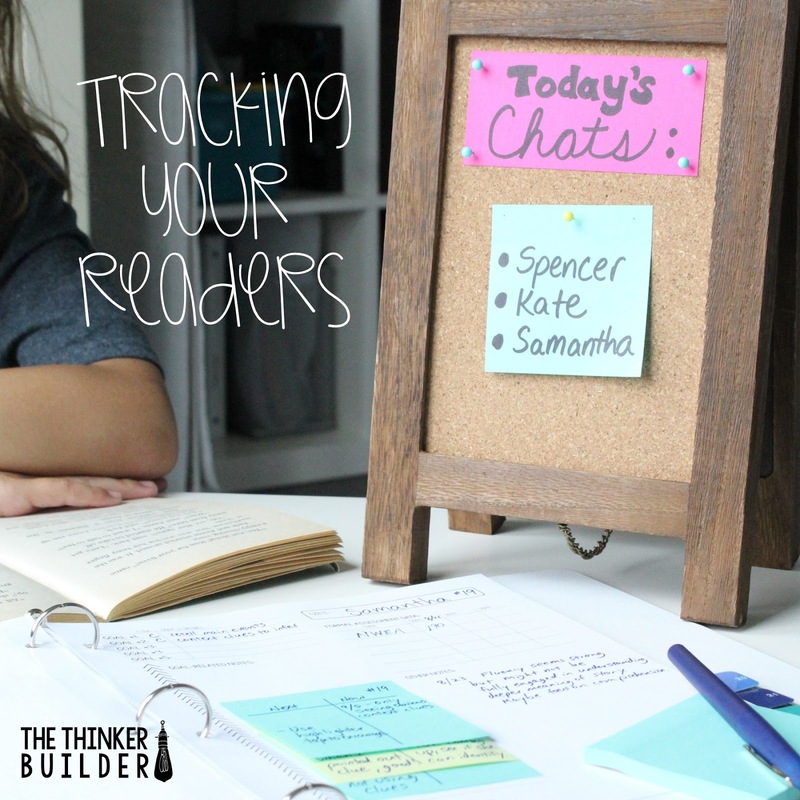 When it comes to tracking the progress of readers during a reading group or one-to-one reading conference, I've been to both edges of the spectrum. On one end, I've used forms teeming with boxes to check and strategies broken down into every possible category. And on the other end, I've used a plain ol' notebook. Like, literally a blank notebook. The only thing I haven't used are digital note-taking programs like Evernote. Maybe that would solve everything, but I've mostly been a pen-and-paper sort of guy. It took me awhile to find the right balance between structure and flexibility. (Hmm, this sounds a little like my other literacy block posts, doesn't it?) I wanted something simple, so it wasn't bogging down the actual interactions with the reader, but also something that enabled me, urged me even, to record significant information that would actually help me move the reader forward, and also sustainable and versatile enough for me to use throughout the year. Before I show you the record-keeping method that works for me, I want to be clear about what I think the purpose of your notes should be: to help you move readers forward. If you can't somehow track it back to that purpose, I don't think you need to write it down. So if I have a purpose for tracking my readers, and I have goals to push towards, what exactly do I write down? For me, there are two categories of things I tend to record, both tied closely to my purpose of moving readers forward: "Now" and "Next." And when I say "write down," I mean something short, specific, and to the point. NOW: This refers to observations I make about a reader right there during the reading group or conference, either evidence of progress toward a goal or a struggle that is significant which might lead to another goal later. NEXT: This refers to where I want to take the reader next, based on the "now." It's the reflective thinking "in the moment," right there at the table, of my next steps with this reader. It is usually one word or a phrase, enough for me either to pick up the thread again in our next interaction, or sometimes to form a strategy group of readers with the same struggle. I designed my forms in a way that solves another glitch I always ran into with other methods. I like to have a dedicated page for each student, but when I met with a reading group and had notes to make, I found myself flipping from one student's record sheet to another, wasting precious seconds and getting annoyed. So then I made a page for each group, which eliminated the constant flipping, but then I had notes about a particular student on her group page and her individual page, which made it cumbersome to look at her growth (in came the flipping again), unless of course I copied the notes from the group page over to each student's individual page, which was even worse than the constant flipping from before. And that's when I started using sticky-notes. I could record notes about a reader on a sticky-note, and I could stick it anywhere... on the group page, on the individual page, on her forehead. AND, the notes are movable! It could start out on the group page and then be transferred to the individual page later. I could stack them, rearrange them, whatever. AND, sticky-notes are small! Using sticky-notes was almost like giving myself permission to be brief. I already knew I didn't like using up interaction time with a reader just to write down a bunch of "stuff." The sticky-note is small enough that I literally couldn't write very much. And hey, if an interaction with a reader brought nothing significant enough to write down, or if I just didn't have time to write it down, I simply didn't. And guess what... there wasn't a bunch of blank boxes staring at me making me feel guilty for not writing anything down. I just had a blank sticky-note ready. 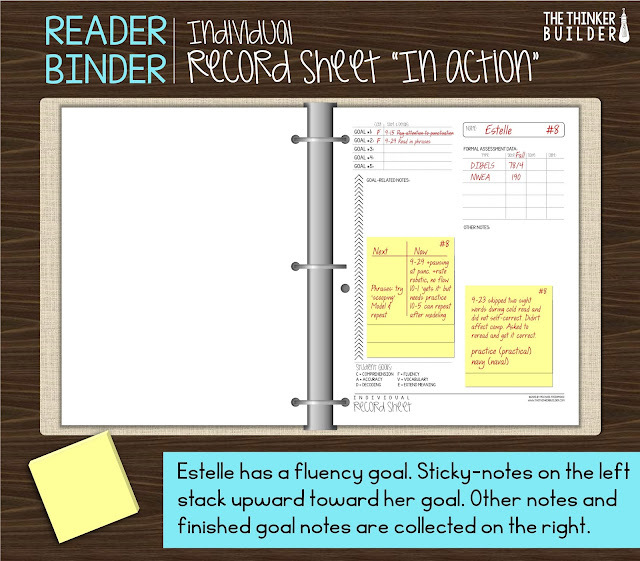 What follows are the forms I created to track readers, to use within a teacher "reader binder" and in conjunction with sticky-notes, all for that same purpose of helping myself move readers forward. Let's start with the Individual Record Sheet. 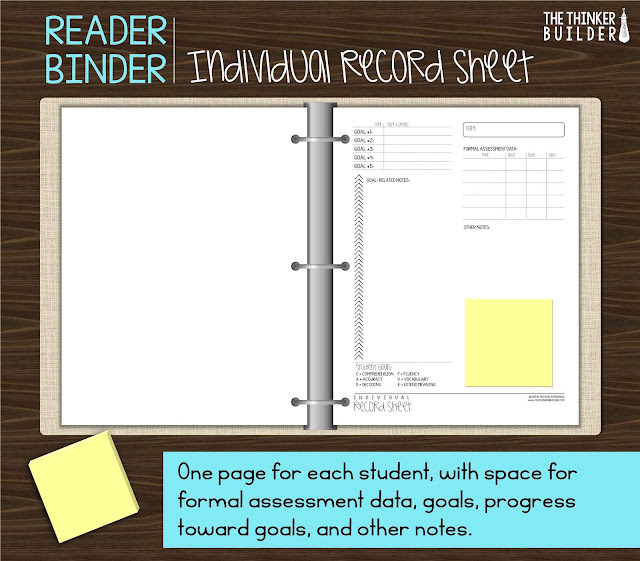 Each individual record sheet has a place for the student's name and number. 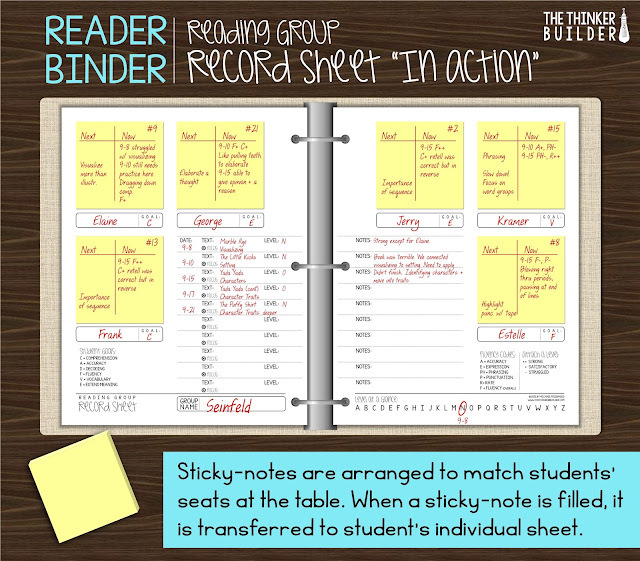 (I assign each student a number to make labeling a sticky-note quicker.) There are basically three parts to the form. In the top right portion is a small table to record formal reading assessment data. I record fall, winter, and spring scores. Below this is an open area to gather sticky-notes of information not related to the student's reading goal. For example, maybe we had a small-group lesson on visualizing, and a student with a fluency goal really struggled, so I may note that here. The entire left side of the form is dedicated to the student's reading goals. The goal is written at the top (using the code at the bottom), and then sticky-notes are stacked from the bottom up, following the chevron arrows, literally reaching toward the goal. When Estelle reaches her goal, or if I feel we should change her goal, I gather the post-its and stick them over on the right side (or even onto the back of the page). Let's zoom in now. You can see five spots for goals, and I've written two for Estelle, the first one being crossed out. 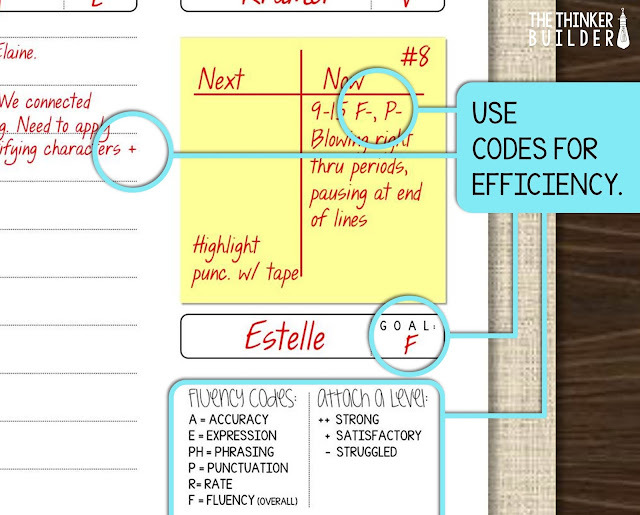 Goal #1 was a fluency goal about paying attention to punctuation. After working with Estelle on this, I felt like she was ready to move on to another goal, so I crossed out Goal #1, signifying it has been met, and we wrote her next goal about reading in phrases. 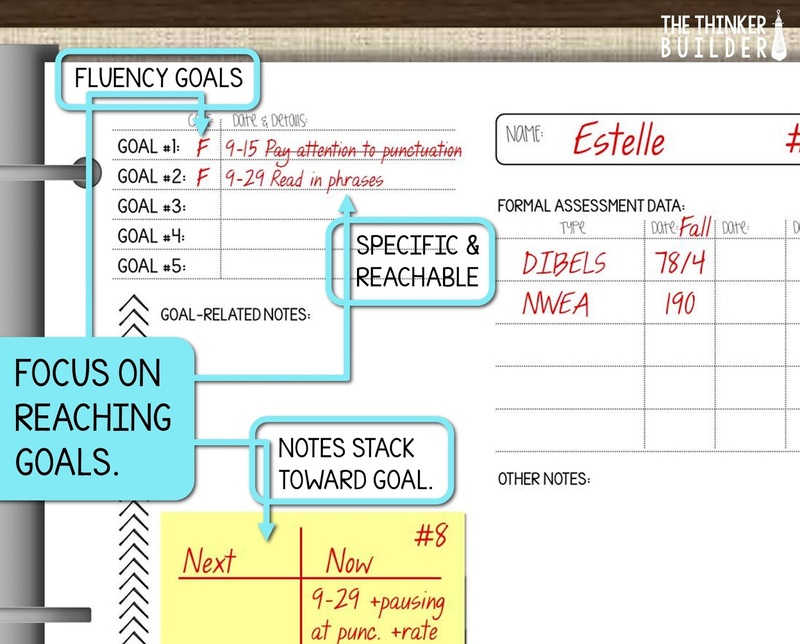 That specific goal is what I'm tracking with sticky-notes during individual conferences and reading groups. So when my binder is open to a specific group's page, I have a left side and a right side. And I have a sticky-note for each student in the group, literally in front of where each student sits. 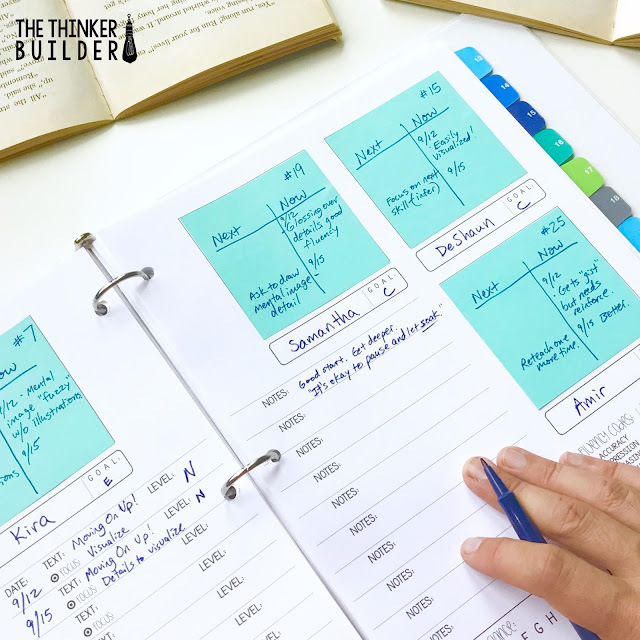 On the left page, toward the spine of the binder, is a space for bare-bones planning for the group: the text we're using, the text's level, and the focus for the session. 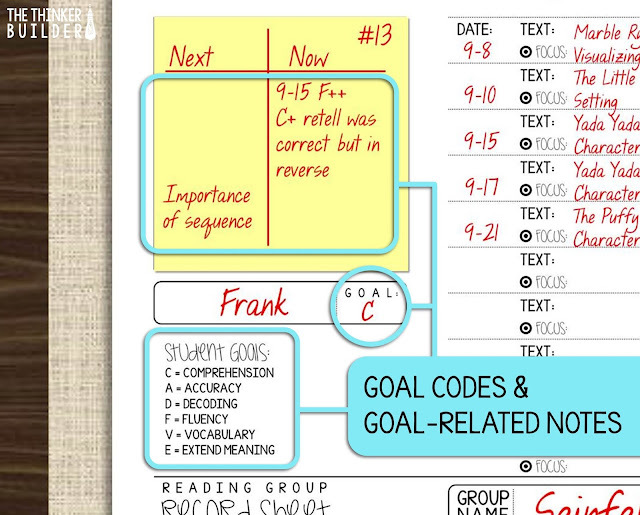 On the right page, in line with the plans, is space for group notes, to help in knowing where to go next. Sometimes it's easier to record something once here than write it six times, one for each student. Also included near the bottom of these forms are some simple codes I use for commonly used language, like for goals and for oral reading record-keeping (e.g. if I'm listening to a student read to me and notice great expression, I could note: "E++" or if I notice trouble decoding a multi-syllable word, I could note: "D-") At the very bottom of the right side is the alphabet, to note the group's current reading level. I like to circle the letter of the current level and record the date we moved to that level. Hopefully over time, I see the level moving to the right. Sometimes it takes a few interactions before I fill a student's sticky-note, and other times I may need to grab a second one to really capture a significant moment. Either way, at any time I can transfer a student's sticky-note over to her individual record sheet. Let's zoom in to a couple of places now. In the image above, you can see the use of codes to help speed up the record-keeping process. You probably have noticed each sticky-note's set-up. I like to make a quick t-chart of my "Now/Next" format on the sticky-note, to help organize my notes. The image above shows that Frank has a comprehension goal, and on 9-15, I noted that his fluency was great, and even his comprehension was good, but out of order. When I asked him to retell what happened in the previous section, he started with the last main event, so I noted in the "next" column to work on "sequence" with Frank. Do you only record goal-related notes during a reading group? What about notes related to the focus of the reading group session? I definitely lean more towards writing notes that are related to students' individual goals. I may make a couple quick notes in the "group notes" section of the form about the focus for the lesson, so that I know where we need to go next as a group, but I usually don't write something down for every student that relates to the group lesson's focus. Why not? I don't have time to write down everything, and I want to focus on recording things that will move readers forward, and I've already identified each reader's individual goal that I think will do so right now. Also, in general, my small-group guided reading lessons support my whole-group reading lessons, and in both cases, whole-group and small-group, students have opportunities to practice a skill in their notebook or with an activity, and these I can use as formative assessments to track progress of those skills. If a reading group is working on cause and effect for instance, how would you have anything to write down for a student with a fluency goal? 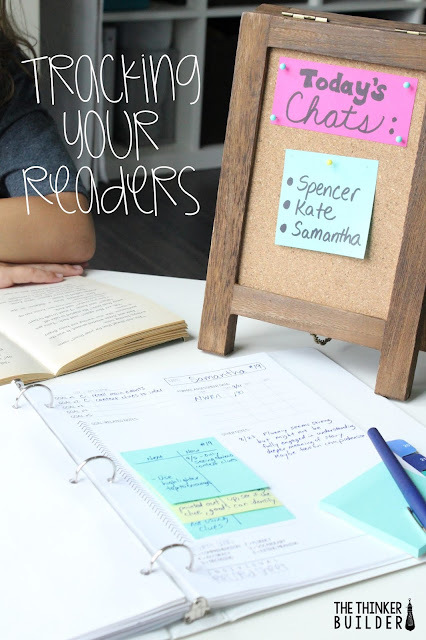 The general structure of a reading group session, for me, is to introduce a focus skill/strategy to the group, model the skill/strategy with a text, and then ask students to practice the skill/strategy while reading the text independently, either in writing or to share/discuss with the group at the end. During this independent reading time, I visit with each reader (or at least half of them, and the other half at their next session) and have them read aloud to me. And THIS is the time I'm checking in with their specific reading goal and trying to relate it to what they are reading to me right now. Sure, sometimes it doesn't match up very well and sometimes I really want to discuss the skill I asked them to practice, but in general, if I write something down during a reading group about a student's individual goal, I do it during those two minutes of one-to-one interaction. What if you want to move a student to a different group? But what you mean is, what happens to the notes and forms, right? 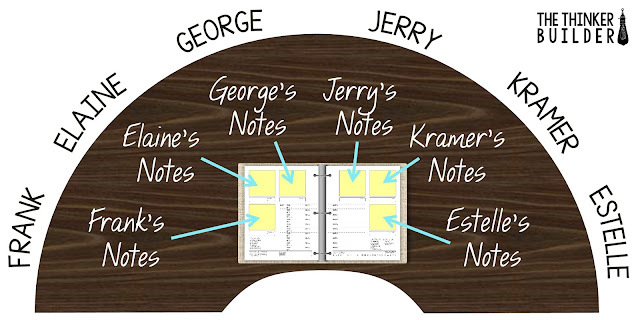 So if I want to switch Jerry and Newman, moving Jerry up a level and bringing Newman down a level for instance, I transfer their sticky-notes to the appropriate reading group pages in my binder, and I cross out (or white-out) their names and write the new member's name (which isn't perfect, I know, but it's a heck of a lot better than trying to rewrite all of Jerry's notes or starting a whole new group sheet just because of one small movement). Now sometimes, especially after a seasonal formal assessment, I'll want to rearrange groups completely. In these cases, I'll start with fresh group forms, and then transfer students' current sticky-notes onto the fresh group forms. How do you organize the binder as a whole? I keep four tabs in my Reader Binder. The second is a place for me to stuff class reports printed from the formal assessments we are required to do (like NWEA, for example). The third is where I keep my Reading Group Record Sheets. I have to pay attention when I'm hole-punching here because I want the left-side form and the right-side form to look correct. I do not copy the group forms front-to-back because if I want to change a group around, or add another sheet, I don't want the way I copied the forms to be a problem. So, if my binder is opened up to a particular group's record sheet (where I'm looking at both the left-side and the right-side), when I turn the page, I'm now staring at blank pages. When I turn the page again, now I'm looking at the record sheets for my next group. The fourth is for my individual forms, one for each student. I do not copy these front-to-back either. I want to be able to flip through and see every student's name in the upper right corner. It also allows me to easily add a second record sheet for a particular student if needed. 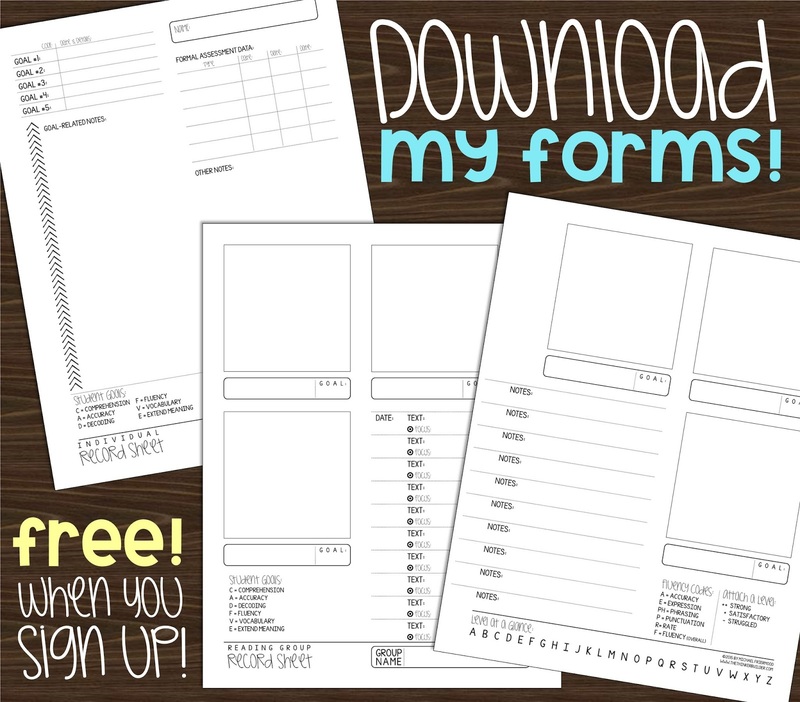 You can download all the forms I talked about in the post (for free!) by signing up for my email newsletter. Included are two versions of each form, one a little more structured (which I used here) and one a little less structured. Sign up just below the following image. Remember, I think you should only record notes that will help you... Move. Your. Readers. Forward.